Anchorage as the name signifies is a component of post tensioning system which is used to anchor the tendons into the concrete while terminating or joining two tendons. Main function of anchorage is to transfer the stressing force to the concrete once the stressing process is completed. 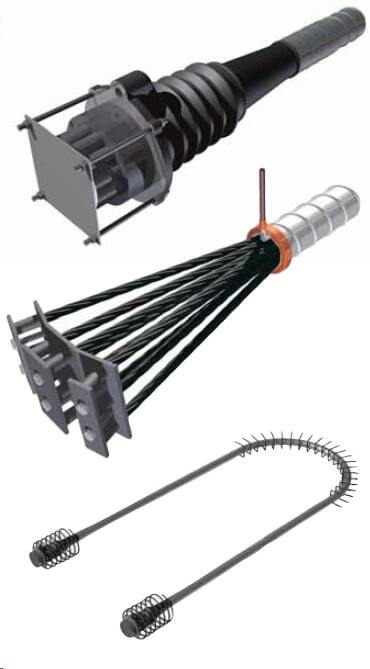 It is one of the most important 5 components of post tensioning systems. Anchorage is an inevitable part of prestressing system. Efficiency of anchorages affects the service life of a prestressed structure. Important components of Anchorage are Anchor plate or anchor head, Removable grouting cap, Iron Block/force transfer unit, Bursting reinforcement, Deviation cone and duct coupler. 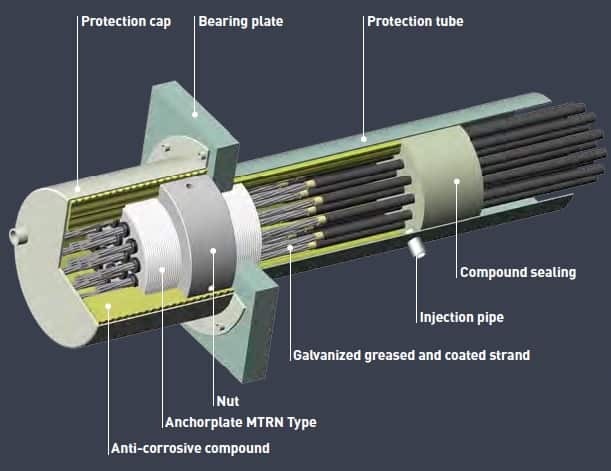 The prestressing force is applied to the strands and locked in place by the wedges in the anchor head which is supported on the force transfer unit cast into the concrete. The force transfer unit ensures the transmission of the prestressing force into the concrete. The force transfer unit and the deviation cone ensure the correct deviation of the strands from the anchor head to the duct. In prestressing, the side of tendon which is stressed is referred to live end. In both side stressing systems, two ends of tendons are live ends. Live anchorages are those which are used at the stressing/live end of the the tendon. Some other types of live anchorages includes Electrically insulated anchorages and external types. Electrically insulated anchorages are used were protection of pre-stressing cables from corrosive agents is required. The cable is enveloped completely in a protective sheathing from outside agents from the starting of anchoring blocks. A dielectric material made of high-density polyethylene is used for covering the tendons. cone that separates strands and inner protective injection from the surrounding elements in the anchorage zone. External tendons can reduce congestion in concrete and better corrosion resistance since it makes inspection and replacement possible. Friction losses are minimum compared to internal tendons as friction occurs at the deviators & anchorage points. especially in the period following the installation of cables, when either the strands relaxation or the viscous effects of concrete can affect the evaluation of forces. 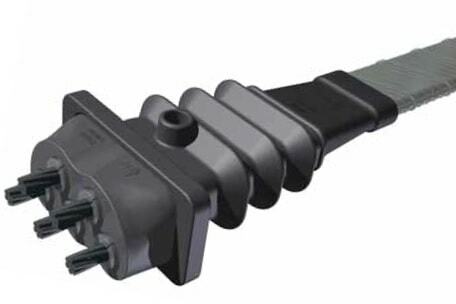 To allow the load check and adjustment, these anchorages are composed of a threaded anchorage with a nut, all protected with a cap filled with grease. 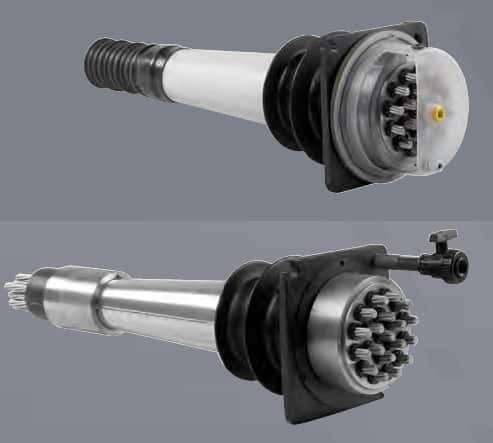 The load adjustment operation is carried out by screwing and unscrewing the thread with a special annular jack, especially designed for these applications. This system is fully replaceable. Bonded Flat System Anchorage is a flat system used mainly in slabs and for transverse stressing in bridge decks. It can also be used in transfer beams, containment structures and other civil applications and for both 13mm and 15mm strands. The system connects bare strands which run through a steel or plastic flat oval duct. The strands are stressed individually using a monostrand Jack. Dead end anchorages are used at non stressing end of a tendon. They are used where the end of a prestressing cable is buried in concrete or is inaccessible during the stressing operation of the tendon. The dead end anchorage configurations is same as the standard anchorage as it uses the same tube unit to guide the strands.